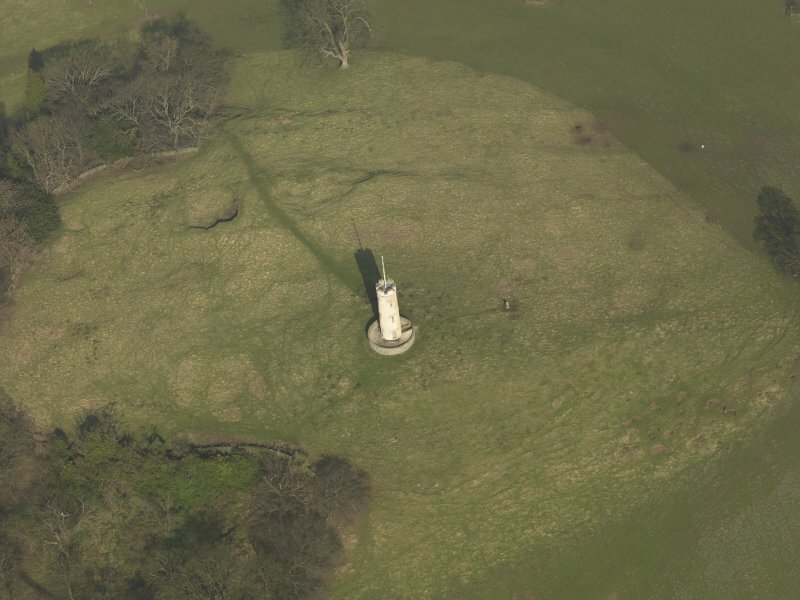 Oblique aerial view centred on the tower, taken from the WSW. 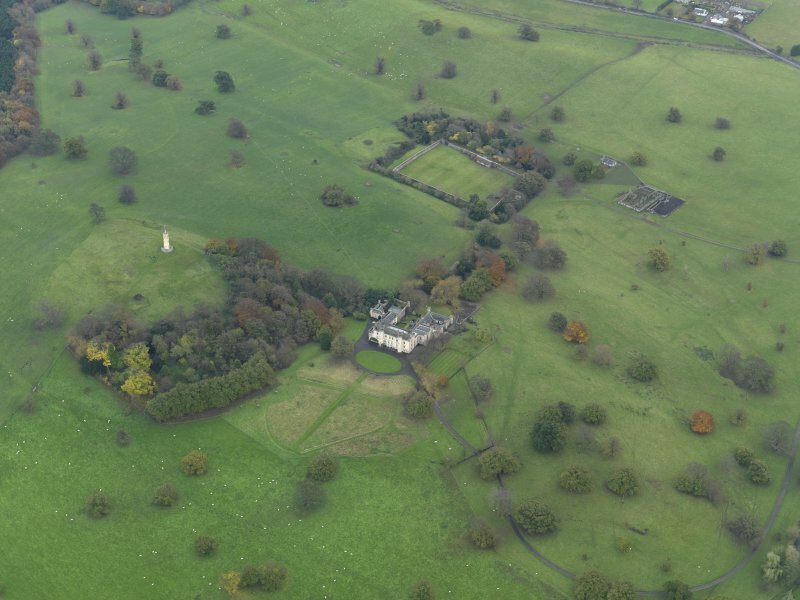 Oblique aerial view centred on the tower, taken from the SW. 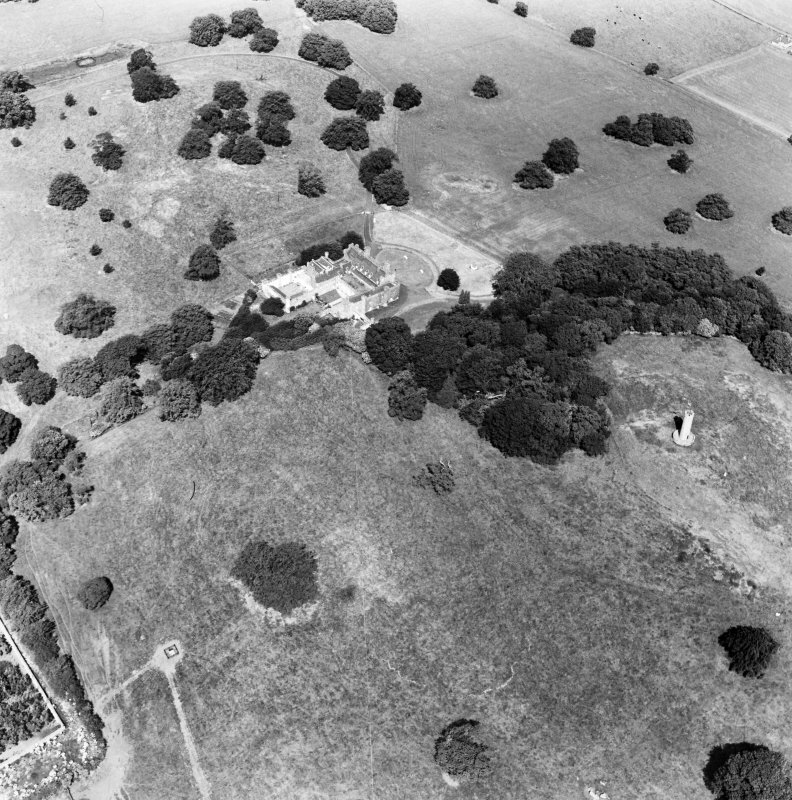 The tower on Binns Hill, property of the National Trust, was built in 1826 as the result of a wager. A circular tower situated on the summit of Binns Hill, of considerable altitude. Formerly it contained a spiral stair by which its summit was gained. The stair is now entirely removed and the whole is in a ruinous state. NT 0530 7860 An archaeological evaluation was commissioned in advance of restoration works on The House of the Binns Tower (NMRS NT07NE 4.01). 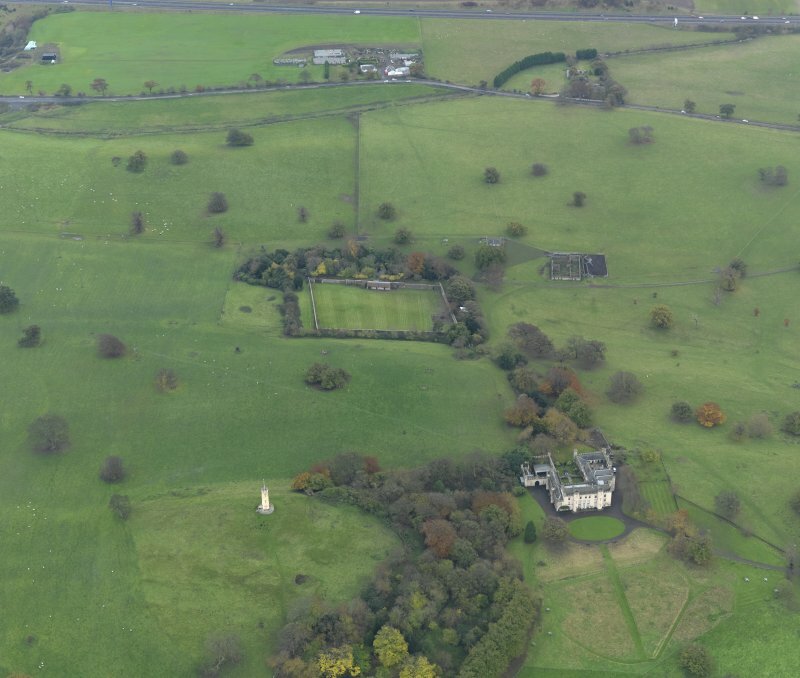 The tower is purported to have been built in 1862 on top of Binns Hill as the result of a wager. The top of Binns Hill is allegedly the site of a Pictish fort and may have been used as a camp or observation post in Roman times although there are no distinguishing features presently visible. 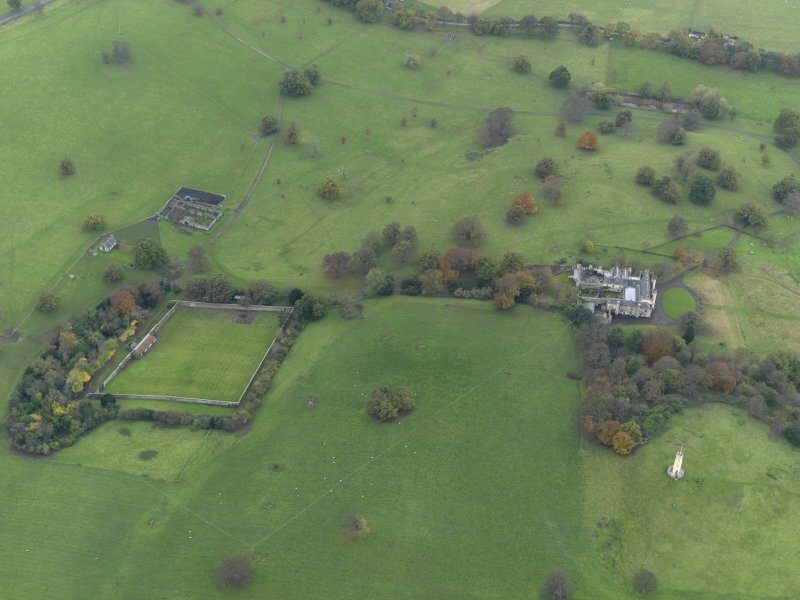 Documentary sources refer to 'the lands of the Bynnis' from 1335 onwards, and the existence of a house before 1478. The archaeological evaluation comprised two trial trenches, one inside the tower and one outside, between the enclosing wall and the tower. The recorded deposits were in all instances contemporary with the construction of the tower. A degraded lime mortar floor was found inside the tower. Outside the tower a gravel surface was recorded. The tower has been built onto bedrock. No deposits associated with earlier occupation of the site were identified. Sponsor:	National Trust for Scotland. A simple rubble stone circular plan tower with crenellated parapet located on the on top of Binns Hill, c.3.0m dia, set within a circular platform with a low stone parapet, c.7.0m dia. Doorway on east side boarded up; ground floor windows on north and west bricked-up, with a blind window on the south side, all tall with a square tops. Two further levels of windows above with cruciform openings, all blind. A flag-staff tops the tower. It was built in 1828 ‘to a specification by Alexander Allan, reputedly as a result of an after-dinner wager by Sir James Dalyell, the wager sum of £100 being more than the said cost of the building at £26-10-0. Modern concrete ‘lecterns’ added to parapet to take view indicator panels; wrought-iron gate and stone steps give access to the platform. 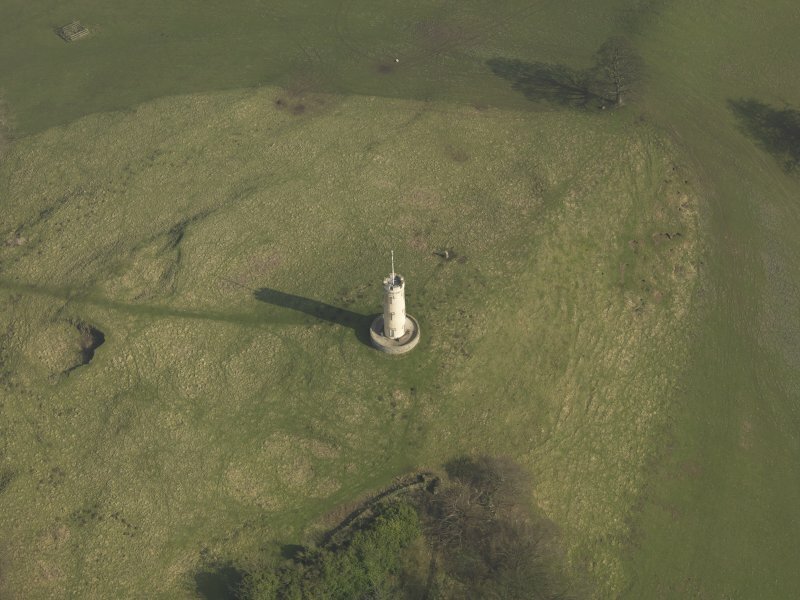 In 1919 a wind-turbine was added to the top of Binns Tower in order to generate electricity, this was removed in 1935. The tower first appears on the 1st edition OS maps of 1855 as ‘Binns Tower’ and then on all subsequent OS maps.